It finally feels like fall here. Finally. After a weird two weeks of 90 degree weather and a late September swim in the Atlantic last weekend. Yesterday, a cool breeze blew the heat and humidity out. It was September picture perfect: clear blue sky, crisp leaves crunching under my feet. It begged me to go apple picking. And that’s what we did. My aunt was along apple picking with Goose and I yesterday. She can’t eat raw apples anymore and was really sad about it so she asked if I could make something apple-y for her. Now, my aunt has many fabulous qualities but baking and cooking aren’t among them. She did, however, manage to successfully make my gluten free cranberry apple crumble for a holiday gathering last year though. 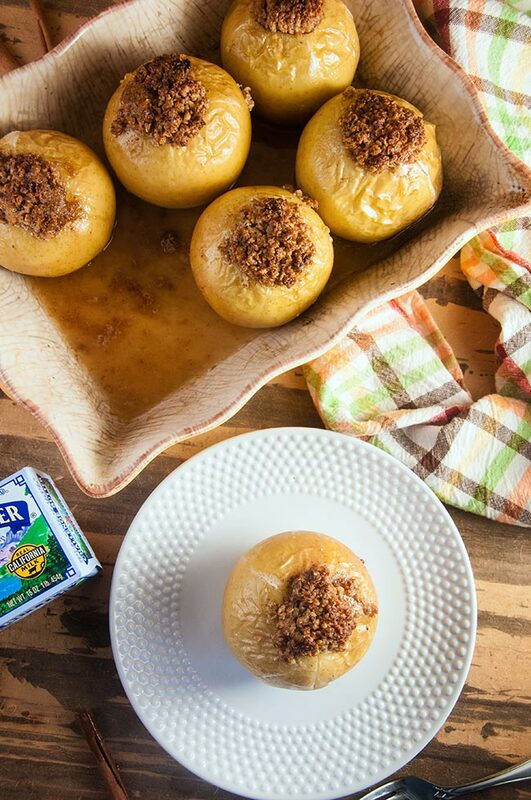 And let me tell you: these baked stuffed apples are so dang good. They are buttery and taste exactly how I imagine fall would taste. And you guys, I really wish you could smell them. My house smelled amazing while these did there thing in the oven this morning. It was such a lovely way to start a fall day. Even better? 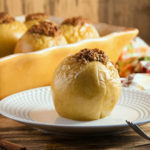 These baked stuffed apples not only made me feel good because they smelled and tasted amazing, they made me feel good because I’m able to help victims of Hurricane Harvey and Hurricane Irma. 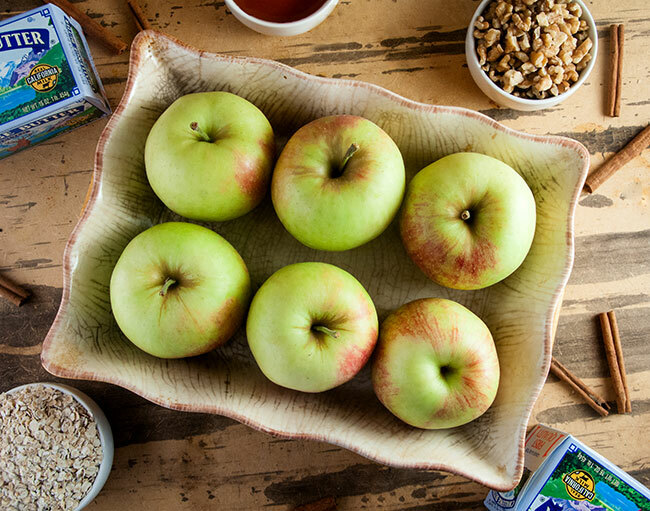 These apples were made with butter made from Real California Milk. Real California Milk is participating in the Great American Milk Drive. When you buy a product made with Real California Milk and use #SealsForGood and tag @RealCaliforniaMilk on facebook or @RealCaliMilk on Instagram through December 31, they will donate $5 dollars to the Great American Milk Drive, which benefits the hurricane relief efforts. What’s not to love about that? So when you make these baked stuff apples, look for the Real California Milk seal and get snapping and tagging. Like this recipe? Sign up to receive 3 delectable chicken recipes and stay up to date on all the sweet happenings here. Preheat the oven to 400. While oven is preheating, core the apples, leaving them hollow on the outside. Place into a casserole dish. Sprinkle cinnamon inside apples. Cut the butter into small chunks, reserving 2 tbs. In a small bowl, mix butter, oats, spices, vanilla, walnuts, and maple syrup together with a fork. The mix should resemble coarse oatmeal cookie dough. Stuff mixture into each apple. Top each apple with remaining butter and brown sugar. Bake in the oven for 15 minutes. Enjoy! We used Jonagold apples. Golden Delicious or Granny Smith would be very good in this as well. *These links are affiliate links. To read my affiliate policy click here. I love baked apples especially in the Fall, it just seems like apples and Fall go together. I was looking on my kitchen to see if I had all of the ingredients and I have everything except the butter made with real California milk. So since they are giving some of the money to the hurricane survivors I will get some. Oh I’m so glad you are going to make these! Let me know how it turns out for you! And isn’t it a great cause? Thank you! They do taste super good! My mouth literally watered watching this, omg. I’m going to have to give this a try very very very soon! What is this heavenly, dreamy goodness before my eyes!! Can you deliver it from your oven to my doorstep? : ) I’ll definitely have to try it out soon! Lol! It’s so easy to make. Hope you enjoy! I love apples this time of year, especially an apple dumpling with vanilla ice cream but I’ve never thought about putting all the filling into the apple like this! It’s like apple pie, but better, because it’s healthier and STILL delicious. I think I’m gonna try these this weekend! Oh man, these look so amazing! I love apples, they are one of my favorites. We are definitely going to have to try this out!! 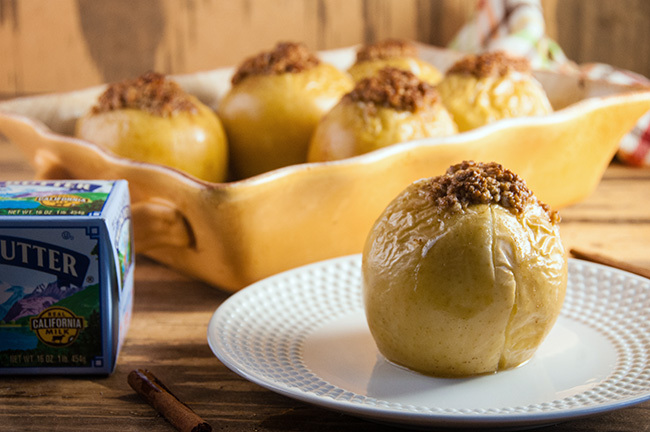 These baked stuffed apples look delicious and I bet they smelled amazing while baking. The family and I went apple picking yesterday and I’m looking for different ways to use up the apples so I’m definitely on the prowl for recipes. Thanks for sharing! They smelled so good! Enjoy! I can’t think of a better fall dessert recipe! So easy, always delicious and perfect for the season. Yum! I love everything apple this time of year!! These look so delicious! Yum! 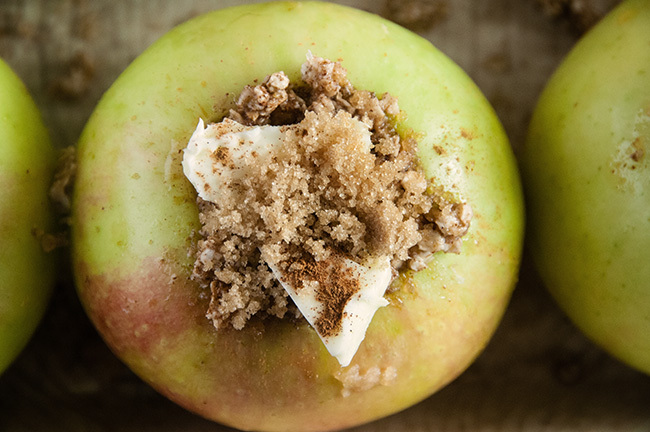 I cannot get enough of these fall apple recipes! I don’t think I would be able to stop eating these, however, they will be going on my list of must makes this apple season! They definitely need to be on that list! 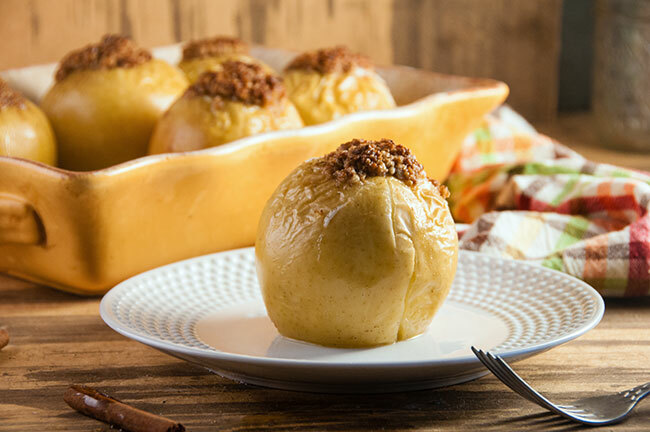 These Baked Stuffed Apples look so good and so easy to make! I can’t believe they only take 30 minutes total! That’s incredible! Can’t wait to try them! OMG, yesss! These look incredible- already drooling just thinking about how good these will smell! OMG they smell so good. I love apples! And this recipe just opened a whole new world of them for me – thank you so much for sharing this! Fantastic creation! This is such a great Fall dessert!